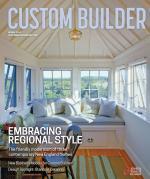 Amy Albert is editor-in-chief of Professional Builder and Custom Builder magazines. Previously, she worked as chief editor of Custom Home and design editor at Builder. Amy came to writing about building by way of food journalism, as kitchen design editor at Bon Appetit and before that, at Fine Cooking, where she shot, edited, and wrote stories on kitchen design. She studied art history with an emphasis on architecture and urban design at the University of Pennsylvania and has served on several design juries. Last year Zillow reported that more than 15 percent of American households are empty nests. As the silver tsunami continues to swell—and as many of us attempt to ride it—that number will grow. This month’s cover story looks at two homes designed for clients embarking on a scaled-down stage of life. Contributor Cheryl Weber, who wrote “Home Alone” (page 10), had her own experience as an empty nester confirmed in the reporting. Weber and her husband deliberately downsized when their second daughter went off to college. Many of Weber’s ideas about what was most desirable for her own downsizing dovetailed with what she observed in profiling two new homes for empty nesters: one in Oregon, and the other in Alberta province, Canada. Indeed, life’s changing stages and aging in place were top of mind in the design of both projects. Sleep becomes more of a challenge as we grow old, but recent research shows that sufficient exposure to daylight can help counter insomnia. Sure enough, both homes boast abundant natural light. In the Alberta house, the stairway becomes a light well. In the Oregon house, an interior courtyard permits light to travel through the home and offers clear sight lines throughout the house, which maximizes its riverside perch.